The Colombina Hotel is situated right in the heart of Venice, just 100 metres from St. Mark’s Square with an exclusive view of the famous Bridge of Sighs. 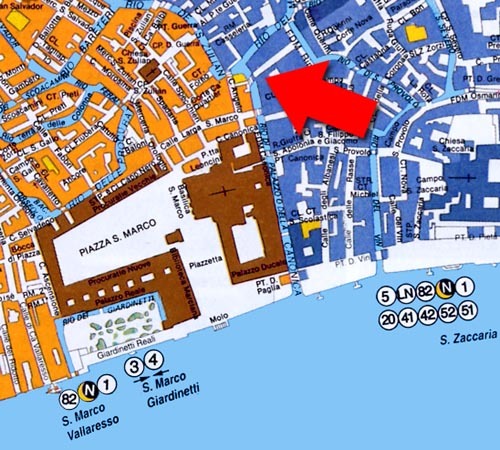 To reach The Colombina Hotel you may either use the water transport (either private or public) or have a pleasant walk through the centre following the numerous sign posts to St. Mark’s. On leaving Venice’s new International Marco Polo airport , take a short journey on the free SHUTTLE BUS which in a few minutes takes you to the marina/darsena where you can catch a water taxi (30 mins.) or the public waterbus ALILAGUNA (1 hour and 10 mins). With the private taxi you could experience the thrill of stepping into the Colombina directly from the boat, using our private water-landing. For those landing at Treviso International Airport, you will firstly need to either catch a car taxi (30 mins.) or an ATVO - EUROBUS to Venice Piazzale Roma Terminal (1 hour) and then from the terminal you can catch a water taxi (20 mins) or the ACTV public waterbus linea 1 or 82 direction Rialto –Vallaresso (San Marco) and get off at the stop of Vallaresso(San Marco) or San Zaccaria. On leaving Venice’s Santa Lucia Railway Station you can either catch a water taxi (15 mins.) or the public ACTV waterbus line 1 or 82, direction Rialto –Vallaresso (San Marco) and get off at the stop Vallaresso (San Marco) or San Zaccaria. If you come by car you can choose to park either in the two main Garages (Autorimessa Comunale or Garage San Marco) in Piazzale Roma or in the Garage dell'Isola di Tronchetto . From both terminals you can catch a water taxi (20 mins) or the ACTV public waterbus linea 1 or 82 direction Rialto –Vallaresso (San Marco) and get off at the stop Vallaresso (San Marco) or San Zaccaria.